1 bag of Mackintosh caramels (approx. 40 caramels). If you want to make these extra crazy gooey, use 3 bags of caramels like my friends Henry and Joan do. Once the water in your double boiler comes to a boil add the margarine, caramels and sweetened condensed milk into the top pot. Keep stirring the ingredients until everything has melted together. Slowly add the mini marshmallows to the melted ingredients in the double boiler a handful at a time until all the ingredients have completely melted. Remove the double boiler from the heat. Using a very large mixing bowl, add about 1/3 of the box of rice krispies into the bowl and add about 1/3 of the melted mixture and stir with a wooden spoon until it’s all mixed together. Repeat 2 more times until all the ingredients have an even coating on then. Spoon the mixture into a greased pan and spread out – use a piece of wax or parchment paper to smooth down and flatten the mixture. 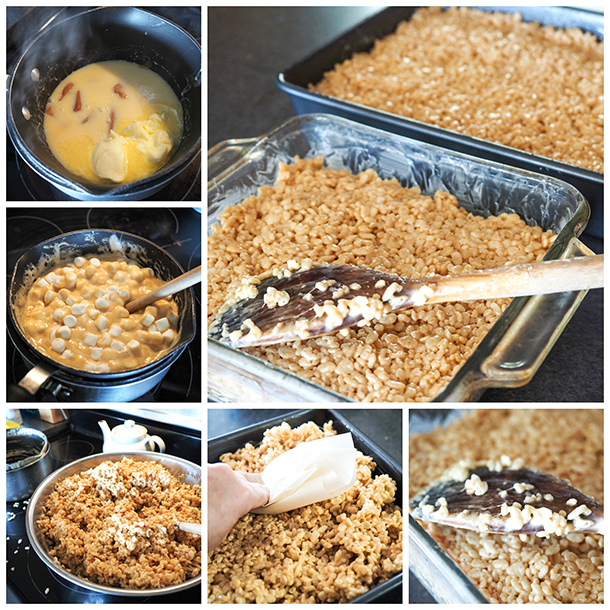 If you have extra mixture left over, spread the remaining rice krispies into a small pan. Allow to cool completely, cut and serve.